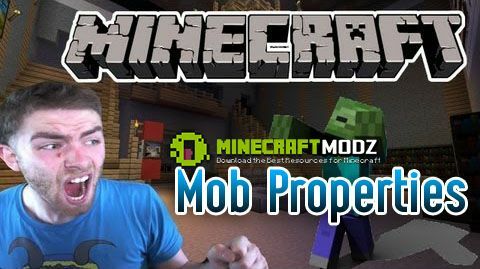 Mob Properties Mod. Think zombies are too slow, skeletons are too strong, or creepers simply don’t drop enough cookies? Well, all you need to do is configure them the way you want them – with Mob Properties! This mod allows you to customize all mobs, vanilla or otherwise, with completely configurable drops, attributes, equipment, names, and even potion effects. To top it off, many properties accept number ranges for values, and are randomized for each mob! The whole aim of this mod is to allow you to modify your mobs with whatever is available to you. Install the mod and run Minecraft once to generate properties files, edit whatever you want, and restart Minecraft. Suddenly, all mobs you’ve edited will drop what you want them to drop and new mobs will have whatever stats you’ve given them! As this is just an alpha release, not all features are currently functioning. You are not able to alter drops based on looting levels, and you are not able to apply custom NBT tags to mobs or items (custom NBT generation is planned for Minecraft 1.7). Apart from the above listed functions, everything else in this mod should be fully operational.